Do your children enjoy playing with playdough? Playdough is popular with children as it allows them to use their imagination, get messy, explore, and be creative. Sure it can drive parents into a frenzy as they are the onces who usually end up cleaning afterwards. Totally worth it though when you see how much enjoyment comes from something so simple. You can either purchase playdough or make your own. Commercial playdough can be quite expensive and although most commercial variations advertise that their playdough is non-toxic they will often also state that it is not safe to eat. So parents don't really know if this is really safe to give to their children. Just to be safe why not have a try at making your own. The variation below is very easy and quick to put together with ingredients found in most family kitchens. It does not contains any toxins and has no strong odors that is normally found in playdough. It can be ready in just 10 minutes and will last for several months. 1. In a large bowl add the flour and salt. Stir well. Set aside. 2. In 4 medium sized bowls add 1/4 cup water in each. Add in a few drops of food coloring in each bowl until desired colors are reached. 3. Add 1 tablespoon oil into each bowl. 4. Pour one cup of the flour/salt mixture in each bowl. Mix well. Once mixed well knead dough for a few minutes and shape each color into a ball. 5. Pour one tablespoon of oil onto a small plate and the cornstarch into a small bowl. Dip each ball into the oil and then roll it onto the cornstarch coating the outside. Knead again for a few minutes. The cornstarch will make playdough extra soft. Get out some cookie cutters or other shaping tools and let your children enjoy. Show them how to use their hands to mold the dough into various shapes and sizes. You will have just as much fun and maybe more. When finished store in a plastic bag or air tight container. 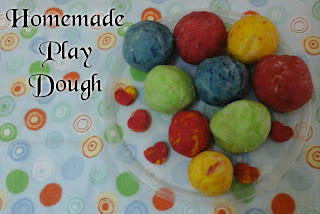 Have you ever made your own playdough before? Cool! Did not realize how easy it is to make play dough, thanks for sharing! I remember making this with my son. So easy and much safer. We love making homemade play dough. We do this on a regular basis. The kids love it! What an easy recipe too!